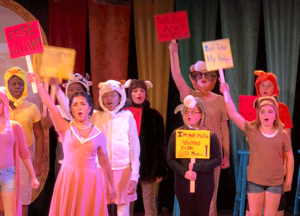 Summer theater campers produce Doctor Dolittle Jr. ABOVE: Some of the youngsters who participated in a 12-day-long summer theater camp at Swift Creek Mill Theatre are pictured above. CHESTERFIELD – Swift Creek Mill Theatre’s annual performance camp ran July 30 through Aug. 10. Thirty-four students learned hands-on 21st century skills by producing and starring in their own show. 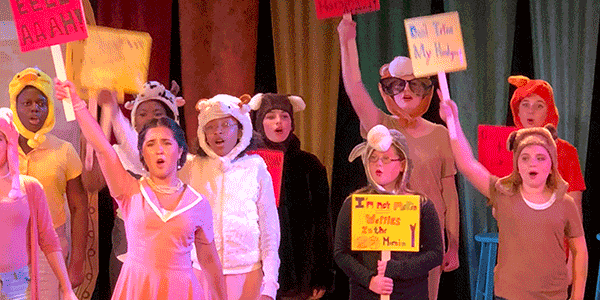 The Mill held public performances showcasing the students’ work on a classic tale of kindness to animals, Doctor Dolittle Jr., for packed houses on Friday and Saturday evenings. Over the two-week summer day camp, area kids ages 10 to 15 learned how to stage a professional play, auditioned for all the roles, rehearsed, and finally presented their Broadway-style, family-friendly production. Based on the Doctor Dolittle stories by Hugh Lofting and the 20th Century Fox film, the musical tells the classic tale of a wacky but kind doctor who can talk to animals. The students, some of whom were new to the performing arts, spent camp days working together to learn lines, blocking, dance moves, vocal projection, set design and construction, costuming, and makeup, in order to become animals and other characters in the show. A team of local professionals taught and guided the students throughout camp. Jeff Clevenger was the director and acting coach; Cynthia Breckenridge was musical director; Natalie Fehlner was choreographer; and Jason “Blue” Herbert was lighting and sound designer.